Amy has been hard at work again organizing the fabulous Blogger's Quilt Festival!!! My entry is the Stashbuster Quilt! This is a pattern from Kathy Doughty and is found in Material Obsession 2. There are so many things I love about this quilt. The bright colors, combination of warm and cool colors, the dots, the piano key border, the stitching and the yo-yo's. The pattern suggests the Kaleido-ruler from Marti Michell. What a great ruler! I have used it over and over, so definitely money well spent. Stashbuster is a crossed canoe block done in a piecey fun way! Sew together strips, from your stash of course, and use the Kaleido-ruler to cut the large triangle. Flip your ruler and use the other side to cut the small triangles! Once the quilt was pieced and a piano key border added, I hand stitched the entire quilt with #8 perle cotton. I stitched around the triangles and then added this strong red line of stitching from point to point. The borders are stitched in a zig-zag pattern. Finally, fun yo-yo's were added at the point where the 4 smaller triangles meet. And there you have it.....The Stashbuster!!! Pattern by Kathy Doughty found in Material Obsession 2. Pop over to Amy's Creative Side and have a look at all the wonderful quilt and add one of your own to the line-up!!!! Such a great quilt - I love all the colours and the hand quilting is wonderful! Beautiful. Just bought the template a few weeks ago. When my holiday sewing is done, will have to attack my scraps to make one of my own. your hand quilting inspires me to get busy and start mine! This is such a wonderful bright happy quilt!! You really know when and where to use a yoyo!!! Everything about this quilt is so gorgeous. How do you have the time to put all these quilts together? Love it! I just picked up that book from the library and hope to have time this weekend to go through it. Beautiful quilt! Love how colourful it is. What a lovely quilt, made extra special with your added touches - hand stitching and the yo-yo's. Very fun! This quilt is so bright and cheery -- it makes me happy to look at it. you picked the cream of the crop for this show!! This quilt makes me happy just looking at it! Oh I love it Mary and the pom poms are insane! I love how it forms different patterns as you look at it. Am I allowed to say that it is better than the original? There, I said it! I L.O.V.E this quilt!!! There are so many amazing elements to it- the colour, the yo-yos, the hand stitching, the border! My favourite all time Mary quilt! Great quilt, and I love the hand quilting with floss! I absolutely love this quilt, beautiful colours and the hand quilting is the perfect finish. I love this quilt! The colors and the hand quilting are just perfect. Funny .... my BQF quilt is also a hand quilted kaleidoscope. Maybe we're secret sisters! Your hand stitching is to-die-for! Very pretty quilt and lovely attention to detail. Love Love Love!!! The colors are awesome!! Happy Weekend! Your hand-quilting is always beautiful. Love your bright color choices! I love your quilts with all of the happy colors and hand quilting, but this one is probably my favorite of them all. Gorgeous! wow, what a lovely quilt! the colorful quilting stitches are my favorite part, but the patchwork is also quite glorious. I love EVERYTHING a bout this quilt!! Just lovely!!! 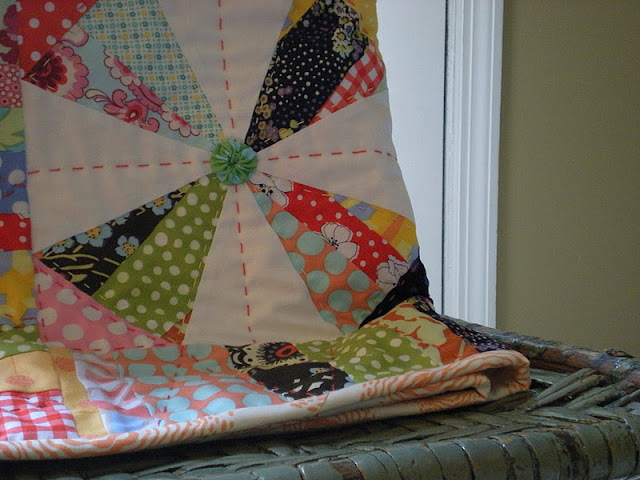 I love this quilt and have plans to make a rendition in 2012! I'm tickled to say that I have seen yours in person! absolutely stunning, love the hand quilting - it adds great detail. Wow, I love this quilt. I have the book and the ruler and seeing this quilt I am thinking I may have to make it. Thanks for sharing. I'm working on this pattern as well! Your's turned out beautiful!! I hope to finish mine before next Summer. ;) I just finished the top yesterday. Love it! Very fun quilt! This is a beautiful quilt and the quilting is such a wonderful addition. So bright and beautiful! The yo-yo additions are adorable! Mary, this quilt always inspires me as do you and your fabulous quilting. Now you are my hero for making such a fantastic scrappy quilt. I aspire to be like you! Really, it is a stunning quilt. Thanks for sharing it! Terrific quilt, especially the hand quilting! Thanks for sharing! Love the colours of this! The hand quilting makes it perfect. Great job. Love your quilt! Great colors and perfect piecing! Gorgeous quilt - love all of the fabrics and your handstitching is beautiful. I love this quilt as you know and I still haven't made it despite good intentions. I love the touch that hand quilting brings. What a delightful quilt and you did a really lovely job. This is such a gorgeous quilt. Great fabrics and I really do like the hand stitching. That is so effective. This is a very cool quilt! Love the pattern and how fun it is! Great hand quilting too! What a great job! I love the yo-yos! Mary - another stunning quilt! I just love the way you handle colour so well - those little touches of black and the inspired red cotton perle grid! What a wonderful quilt! Love everything about it. You did an outstanding job! 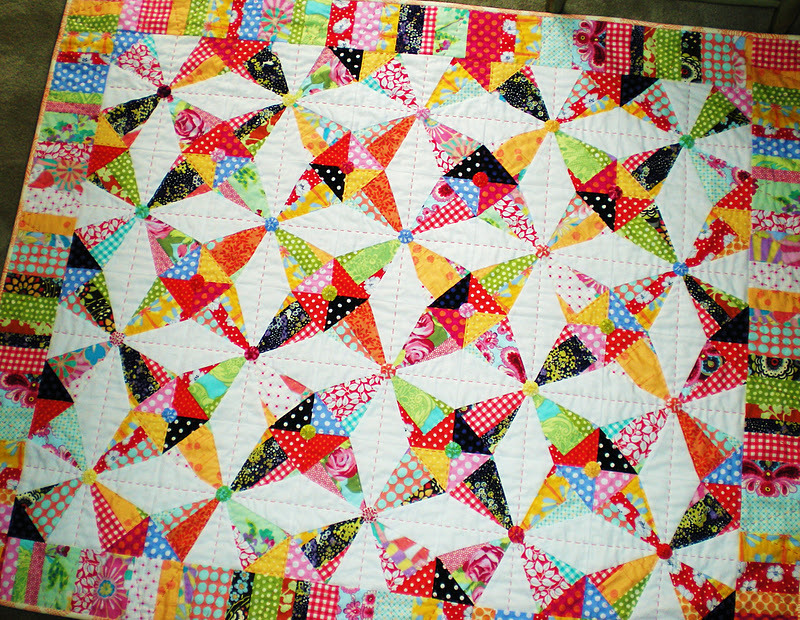 What a bright and beautiful quilt...thanks for sharing.